The road to retirement is a journey with many stops along the way. Getting there requires saving and investing to build enough wealth to pay for your golden years. Eliminating your debts is also a part of the trip – it’ll make your nest egg last longer. It wasn’t too long ago that paying off your home mortgage was one of the first big stops along the way. It’s not as common anymore. 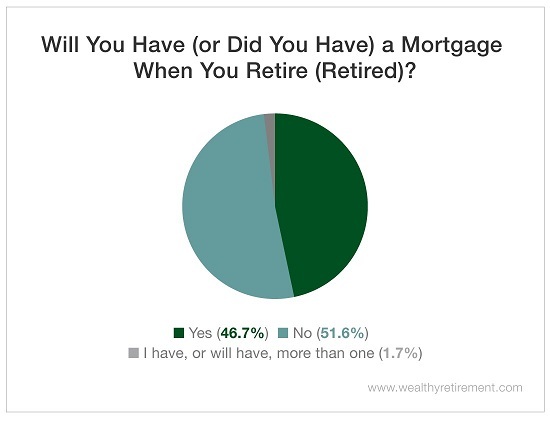 According to a recent survey of Wealthy Retirement readers, less than 47% said that they already have their mortgage paid off or will have their mortgage paid off by the time they’ve retired. In 1995, just 22% of homeowners 65 and older had mortgage debt. 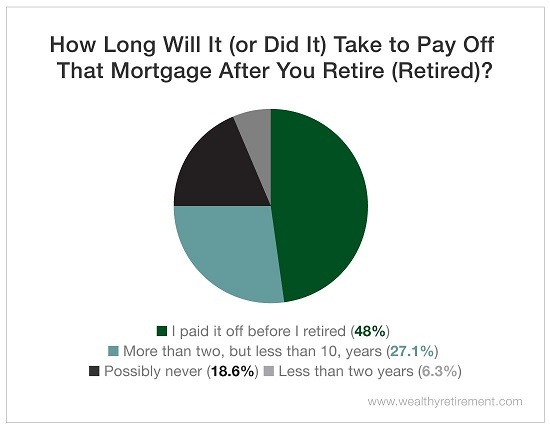 Worse, more than 18% of Wealthy Retirement respondents said that they may never finish paying off their mortgage. Another 27% said they’d be making payments for two to 10 years after they retire. Getting out of debt used to be a chief retirement goal. Today, though, our survey and others like it show that attitudes about debt in retirement have changed. Carrying any type of debt is a real threat to your retirement security because servicing it requires a monthly outlay of cash flow. And while paying it off might not seem like a burden when you’re working, making those payments gets a lot harder when you’re living on a fixed income. Aside from saving, preparing for retirement involves finding ways to reduce your cost of living. The goal is to help your nest egg last longer. Getting rid of your mortgage goes a long way because you drastically reduce one of your biggest monthly retirement expenses: housing. Now don’t get me wrong: Not all debt is a death sentence for your retirement plan. Some debt, like mortgage debt, is better than other kinds, like credit card debt. Typically, credit card debt carries a much higher interest rate than mortgage debt. Carrying debt on a credit card is a far greater threat to your savings than carrying a mortgage. Mortgage debt can also be tax deductible, which makes it more manageable. But just because mortgage debt is better than credit card debt doesn’t mean that it’s good for your retirement. Some experts will argue that it’s better to carry lower-interest mortgage debt into retirement and invest with the funds you’d have used to pay it off. This is a form of interest rate arbitrage: You’re borrowing money for your mortgage at 4% and earning 7% in the stock market. In theory, this makes a lot of sense – especially if the market is going up. But the reality isn’t that easy. The market will eventually head south. It may even crash, and then what? Most people don’t have the discipline to hold on when the value of their investments falls. They’ll sell at a loss and wind up with less money than if they’d paid off that mortgage before they retired. They’ll also still be on the hook for their monthly mortgage bill, a big expense they could’ve gone without in retirement. In general, it’s best to retire with no debt. The next best plan is to hold on to as little debt as possible. Carrying it hurts cash flow, which can add a big hurdle to your retirement planning. Pay down all of the debt you can while you still have the income to do so.